Acorn is a Highly Recommended Guest House in George offering Luxury Accommodation in the Garden Route. Centrally located, walking distance to restaurants and less than 15 min from the airport, beaches & top golf courses. 40 Minutes driving to Oudtshoorn, Mossel Bay & Knysna. Acorn Guest House offers B&B Accommodation in 13 stylish rooms, each with en suite bathroom amenities and a small kitchenette. Winter 2018 Golf Packages on Offer! 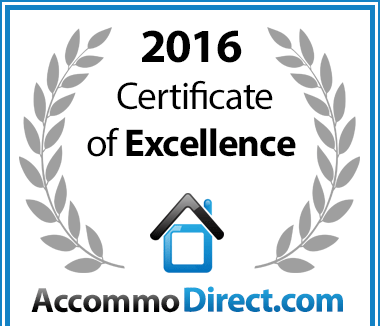 In recognition of exceptional service Acorn Guest House in George, Garden Route is hereby awarded a Certificate of Excellence. Small internal Queen Room with private en-suite, tea and coffee making facilities, small desk, and limited free WiFi internet access. Also includes communal lounge, swimming pool and secure off-street parking. Air-conditioned rooms with private entrances & a view over the pool and Outeniqua Mountains. The King rooms offer space and luxury, king-size/ twin beds, en-suite bath/showers, heated bathroom floors and electrical towel rails. Each has a concealed bar fridge and microwave. Queen size bed and two single beds, ideal for 2 adults & 2 children. En-suite shower, air/heat-conditioner, tea/coffee facilities, microwave, bar fridge, private DSTV decoder, safe and a separate entrance overlooking the pool. Our sister establishment opened its door is April 2012 & offers a selection of two and one bedroom mountain-facing suites. Each has an en-suite bathroom with a shower, has a lounge and dining area, FREE WIFI, sport and movie satellite channels, flat screen TV's in each room & in the family lounge, fully equipped kitchen and courtyard or balcony.